Less than 3 months to go to opening day 2014! 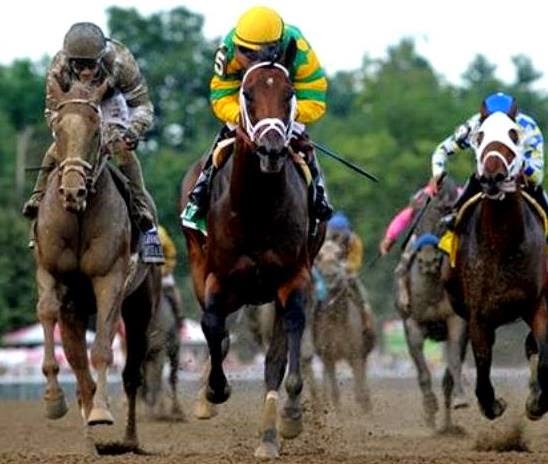 Till then, 2 weeks to the Kentucky Derby and the beginning of the Triple Crown races, as well as more of our favorites from last year who have already resumed their winning ways this year--e.g., Will Take Charge, Princess of Sylmar, and Wise Dan. On to the remainder of the Top Ten. Actually, as in past years, maybe a few more than 10. In the last installment, we looked at #'s 5 through 7: Alpha in the Woodward, Dance to Bristol in the Ballerina, and Capo Bastone in the King's Bishop. Here goes with #'s 8 through 10, plus a few that just couldn't go unmentioned. The son of Curlin showed that his 3+ length victory a month earlier in the Belmont Stakes was no fluke. Trained by Todd Pletcher and ridden by Mike Smith, Palace Malice was kept in 2nd, a couple of lengths behind front runner Moreno. He took the lead at the top of the stretch, seemingly without too much effort, and made it to the finish line 2 lengths ahead of hard charging Will Take Charge. The distance was much greater to Code West, My Lute and a good sized field of other 3 year olds. Palace's final time was within a second of Lawyer Ron's Saratoga record for the 1& 1/8th mile. This Irish mare began racing in 2011, at 3, in her native country and in Canada. The following year, Laughing came to the United States and was victorious in her first race at Aqueduct, an allowance optional claiming. But it was last year, at the age of 5, that this daughter of Dansili--with Danzig (and thus Northern Dancer) on top and bottom--blossomed. Laughing won 4 graded stakes on the turf. One each at Monmouth and Belmont, and 2 at Saratoga. Trained by Alan Goldberg and ridden by Jose Lezcano, she went right to the front in her first race at Saratoga, the Diana. She was stalked by Centre Court, who challenged her in the stretch before fading. 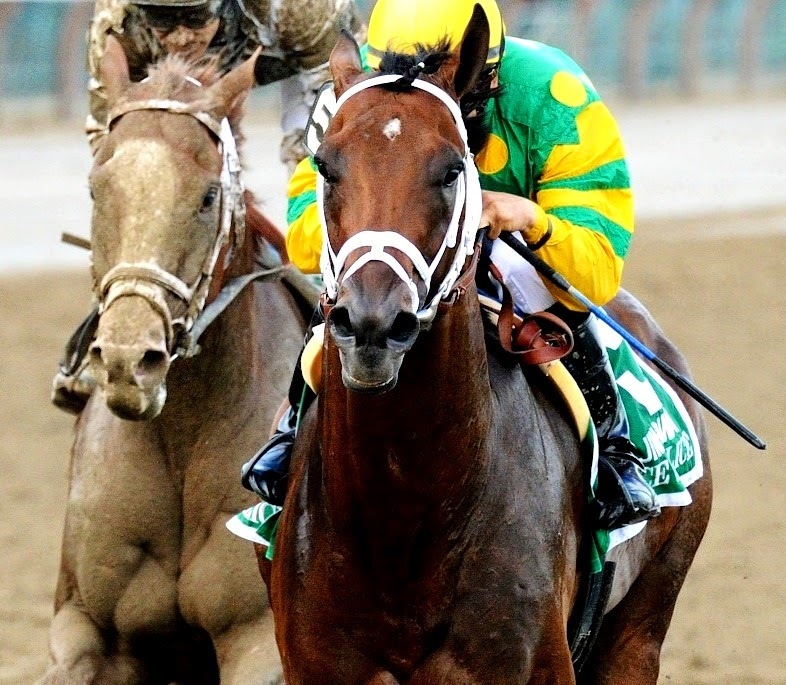 Approaching the finish, she held off the Chad Brown trained Dream Peace for a thrilling race to the line. 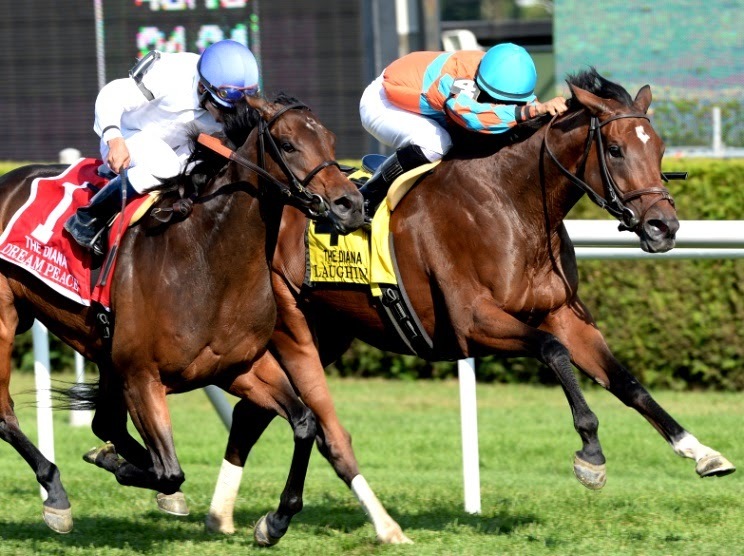 A month later at Saratoga, she won the Ballston Spa in similar style. 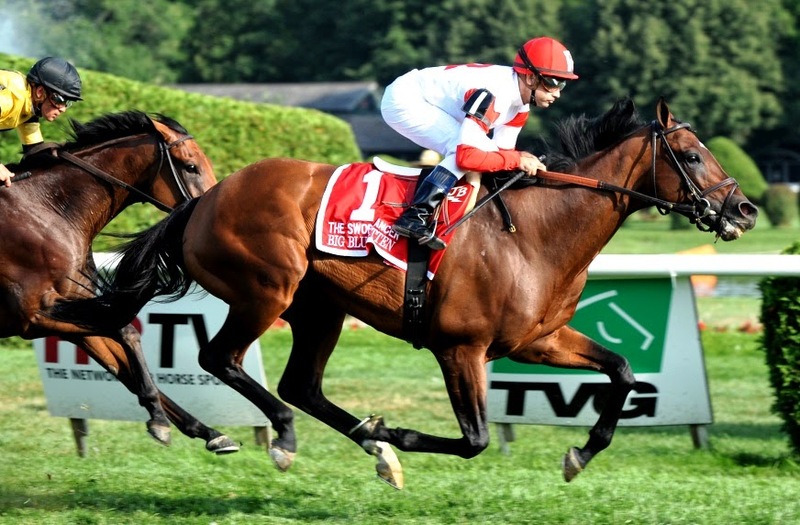 In that Travers Day race, she outlasted Pianist, another Chad Brown trainee, to win by a neck. And another month after that, she was victorious one last time at Belmont in the Flower Bowl, again front-running from start to finish. Owner Richard Santulli had intended to campaign his 6 year old one more year. But very sadly, Laughing developed colic early this year and died on the operating table. She had a career record of 8-2-2 out of 16 starts. She was an exceptional athlete, apparently a very sweet one, and she certainly was a champ at the Spa last year. Who doesn't love the just-retired Hessonite? 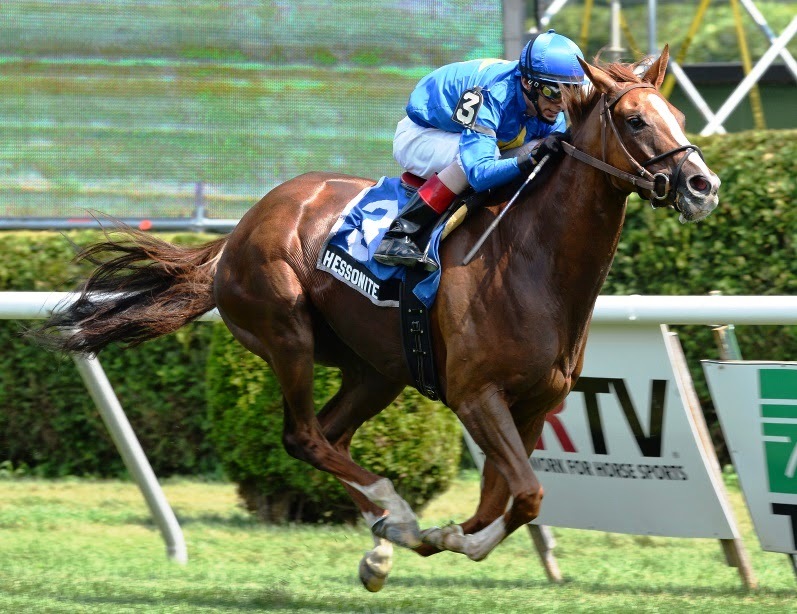 The blaze-faced chestnut, 2-time New York bred champion (filly or mare turf, 2011 and 2012), who was purchased by owner William Punk at Keeneland in 2009 for $27,000, won 11 of her 22 starts, including 9 stakes. The On the Bus overnight stakes, on opening day 2013, was her swan song. She had just raced at Parx 17 days before. But despite that 4th place finish, she was hammered at the windows when she returned to Saratoga. And Hessonite did not disappoint the fans who bet her down to 4-5. Trainer David Donk believed it was time for Hessonite to move on to a new career as a broodmare. The daughter of New York turf sire Freud was sold at the Fasig-Tipton Kentucky 2013 November Sale for $750,000. Good luck to Hessonite making babies, and thanks for all the thrills. The then-4 year old son of Unbridled's Song quickly took the lead and never looked back. 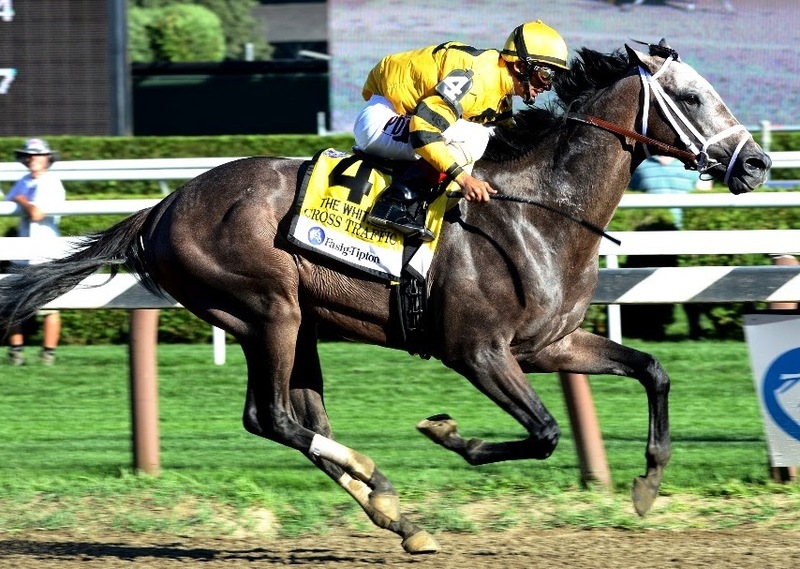 Trained by Todd Pletcher and ridden by Johnny V, Cross Traffic faced a talent packed field in the 2013 edition of the grade 1 Whitney. Unable to catch the front running Cross Traffic was Successful Dan (who had won the Alysheba at Churchill), Mucho Macho Man (who later won the BC Classic), Alpha (who won the Woodward later in the meet), Ron the Greek (who later won the Jockey Club Gold Cup at Belmont), Fort Larned (who had won the Stephen Foster at Churchill and last year's BC Classic), and others. Unfortunately, Cross Traffic was injured when he stumbled out of the gate at the Jockey Club Gold Cup at Belmont in late September. He has not raced since. The son of Kitten's Joy, trained by Chad Brown and ridden by Joe Bravo, had won the United Nations at Monmouth the month before. 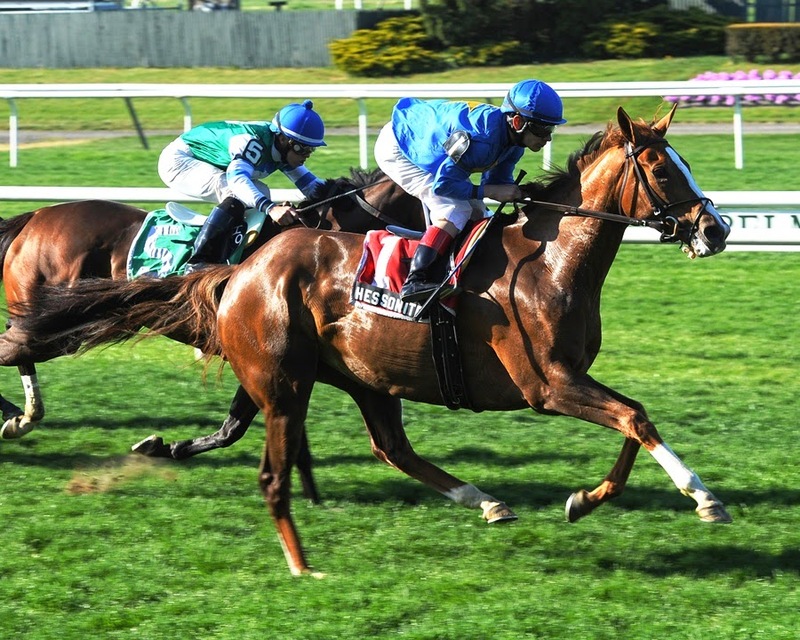 Now, in his 2nd grade 1 in a row, Big Blue Kitten was kept several lengths from the front for most of the mile and 1/2 distance on the inner turf. Still 4th at the stretch, he rallied to take the lead at the sixteenth pole and literally took it easy to the finish line. 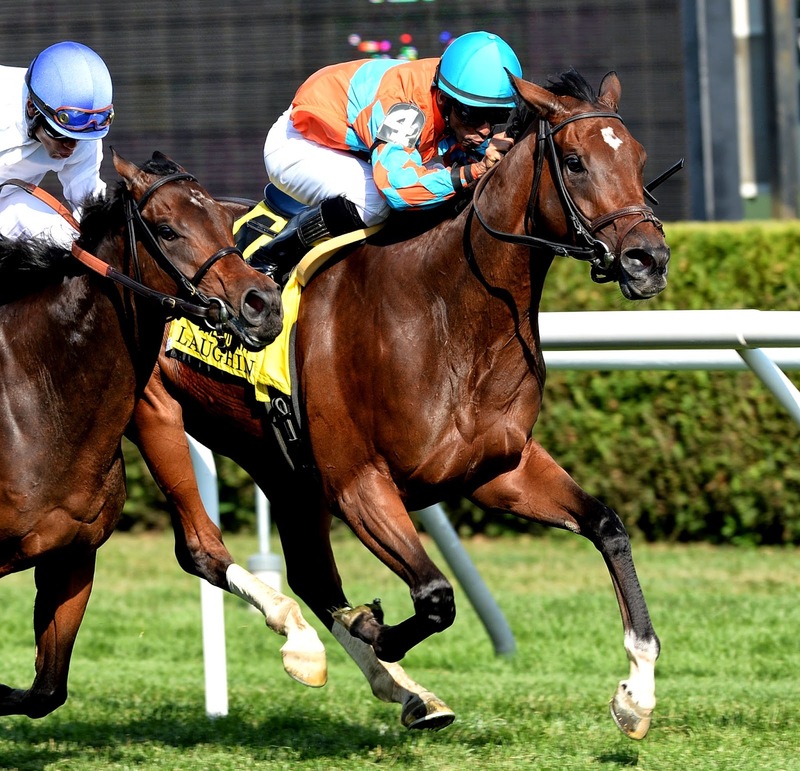 This was his 2nd win at the Spa, having won the grade 2 Hall of Fame in 2011. The then 2-year old son of Stormy Atlantic took the 6 furlong grade 2 on opening weekend. Ridden by Shaun Bridgmohan, Wired Bryan gave trainer Michael Dilger--an assistant to Todd Pletcher for several years--his debut win at Saratoga. The gray/roan colt went to the front early on and his lead was never seriously in doubt. He finished more than 5 lengths ahead of his closest rival. Well, that's the Top Ten Plus. What great athletes, magnificent creatures, thrilling us with their beauty, grace, speed, endurance, and courage. It's easy to understand why thoroughbred racing is loved around the world. And why Saratoga, where the sport is at its best, is so special. 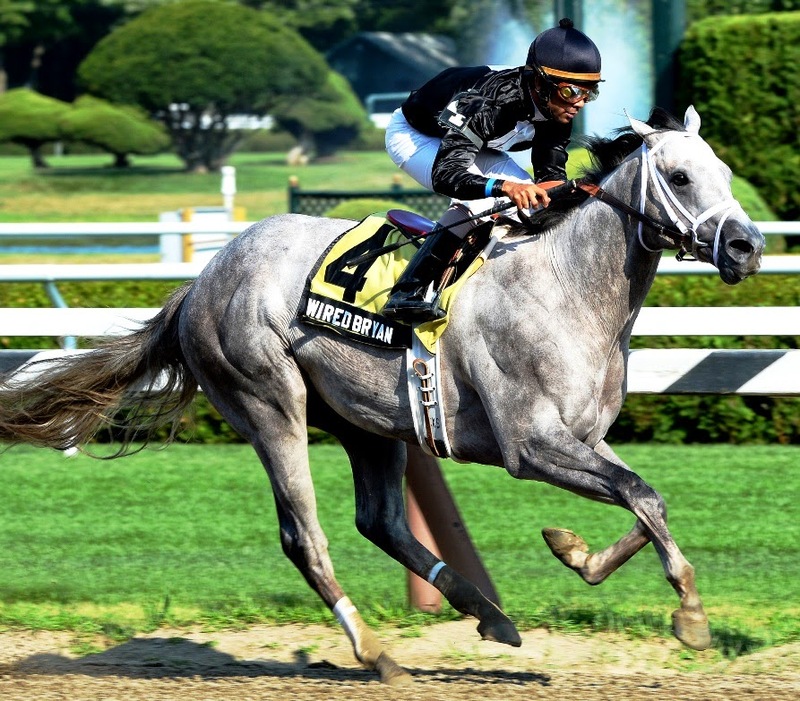 And speaking of special, in the next and final installment of Saratoga Highlights 2013, we'll focus on that other species that's essential to this game. The humans. The ones who train and ride those breathtaking equines.